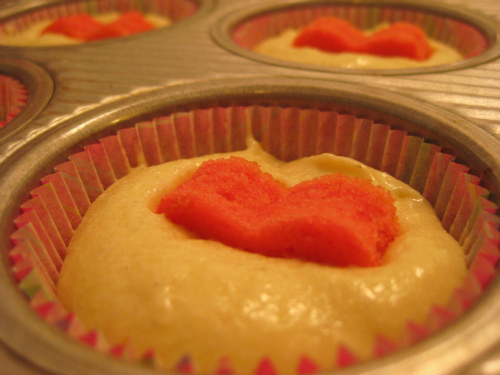 These heart shaped cupcakes are looking difficult but surprisingly simple. You can use your cupcake recipe as well. 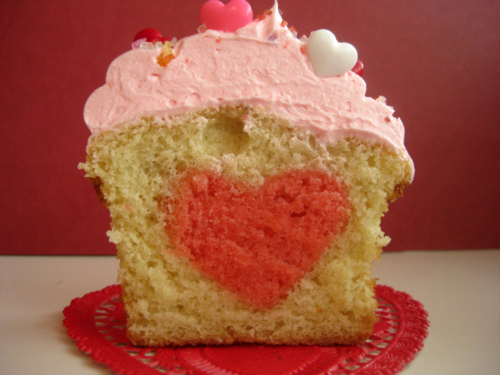 Bake these lovely heart cupcakes and show affection to your family. Preheat the oven to 350°F/200 degree C. Use a nontoxic marker to make a small dot on the edge of 12 paper liners and place them in one standard muffin tin, with all the dots facing the same direction. Using a hand mixer or electric beater combine the butter and sugar on medium speed until creamy. Add the eggs, one at a time, mixing in each egg completely before adding the next. Add the vanilla essence, baking powder, baking soda, and salt. Use a spatula to scrape down the sides of the bowl, then turn the mixer up to medium-high speed and mix for another 30 seconds, until all the ingredients are well combined. Finally, add the flour, ½ cup at a time, alternately with the milk, ⅓ cup at a time, mixing until each addition is fully incorporated before adding the next. Scrape down the sides of the bowl one more time and continue to mix the batter on medium-high speed another 30 seconds. It should be smooth and creamy. Pour approximately 1½ cups of the batter into a smaller bowl. This will be for the hearts. Use a spoon to stir in red food coloring, 2 or 3 drops at a time, until you get your desired shade of red or pink. Keep in mind the color will lighten a little while baking. Pour the pink batter into a nonstick or lightly greased 8-inch square baking pan and bake for about 20 minutes, until a toothpick inserted into the center of the cake comes out clean. Allow the cake to cool completely. Once the sheet cake is cool, loosen the cake from the pan by running a knife around the edges of the cake. Carefully invert the pan onto a cutting board. 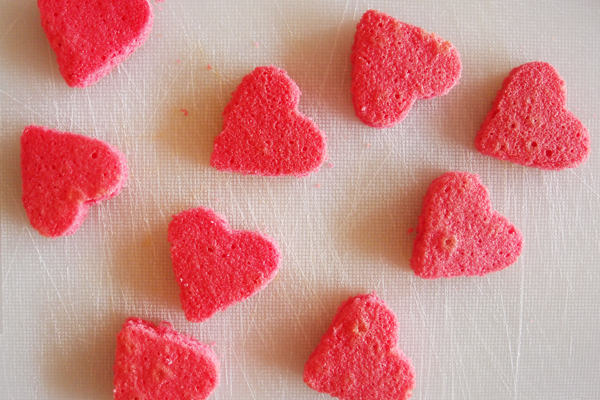 Use a 2-inch heart-shaped cookie cutter to cut out 12 hearts. If you can’t find a small heart-shaped cookie cutter, draw a heart on some clean cardboard and use that as a stencil to cut the hearts out with a small knife. Spoon 2 heaping tablespoons of the remaining plain batter into the prepared tins. 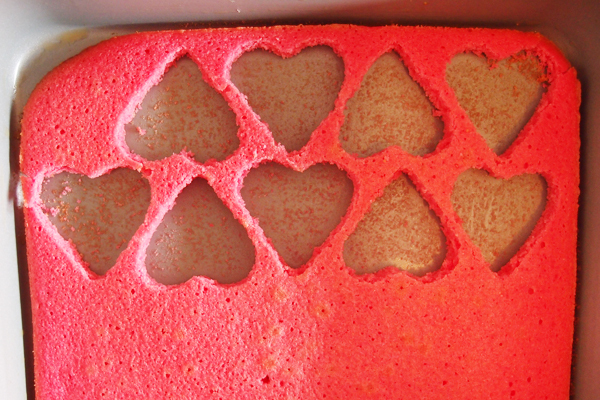 Place a heart in each cup, with the bottom of the heart pointing down and the front of the heart facing the dot on the cupcake paper. Press the heart gently into the batter. Cover the top of the heart with another teaspoon of batter. Bake for 24 minutes, or until the edges of the cupcakes have started to turn golden brown and the cake springs back when you gently press your finger into the top of it. Allow the cupcakes to rest in the tins for 10 minutes before transferring them to a wire rack to cool.